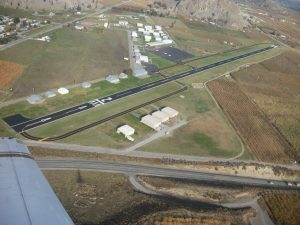 The Lake Chelan Airport (FAA LID: S10), is a general aviation public use airport located three nautical miles (6 km) northeast of Chelan. The airport is owned by the City of Chelan and the Port of Chelan County. Lake Chelan Airport offers self-service Jet A Fuel and Aviation Fuel 24 hours a day at very competitive prices. There is also a pilot’s lounge with a kitchen, shower, Wi Fi and a land line telephone. Pilots should be aware there is considerable parachute landing activity in the spring, summer and early fall at the Lake Chelan Airport. Common Traffic Airport Frequency (CTAF) and Pilot Controlled Lighting Frequency (PCL) are both found at 122.90. AUNICOM Frequency is 122.95. The Airport Master Plan for the Lake Chelan Airport is going to be updated. The City of Chelan, Chelan County and the Port of Chelan is working together with J-U-B ENGINEERS to complete the update. It is expected to take approximately two years from start to finish. The project and its process will be shepherded through City Council. An Airport Master Plan update is periodically recommended by the Federal Aviation Administration (FAA) to consider potential future improvements to the airport. The planning process includes analyzing existing airport uses and facilities in order to provide short-, intermediate- and long-term development recommendations to the Chelan City Council. Airport Master Plan Updates are done to identify future opportunities and challenges, gain concurrence for a selected course of action from the FAA and the Washington State Department of Transportation, aid with regional planning, and help connect with the community. The planning process includes aviation forecasts, facility requirements, alternative development, environmental considerations, an aeronautical survey, geographical information system mapping, updated airport layouts, facilities implementation plan and a financial feasibility analysis. Project costs are paid ninety percent by an FAA grant, five percent by a state of Washington grant and five percent locally, by the City. The J-U-B project team includes engineers, planners, surveyors/GIS professionals, environmental specialists, and a public involvement specialist. The J-U-B team will work with a local citizens via a Technical Advisory Committee, consisting of airport users and community leaders, to work through the process and ultimately develop a 20-Year Capital Improvement Plan (CIP) to recommend to City Council. Two public forums will be held to gather public feedback and share project updates: one after development of the alternatives, and another after development of the draft plan. The public may contact the project team with questions and feedback throughout the process by emailing or calling J-U-B representative Gemma Puddy, gpuddy@langdongroupinc.com or 208-292-8515.